Recently, Delegate365 got a new reporting engine with version 7.3 and more reports have been added with version 7.4. In total, there are now 86 reports available (and likely more are about to come in the following versions). To keep up with the latest reports, we want to deliver an overview of all available reports at a glance here. The reports menu reveals the Delegate365 reports list. The reports are available for all users in Delegate365, for Scope Admins and for Portal Admins. Scope Admins see just data of their entitled OU’s in all their reports. Portal Admins get additional reports marked with a star* and a comment (* Portal Admin), that deliver reports and statistics about the Office 365 tenant and services without any OU filters. The screenshot below shows the reports list, grouped into nine categories. 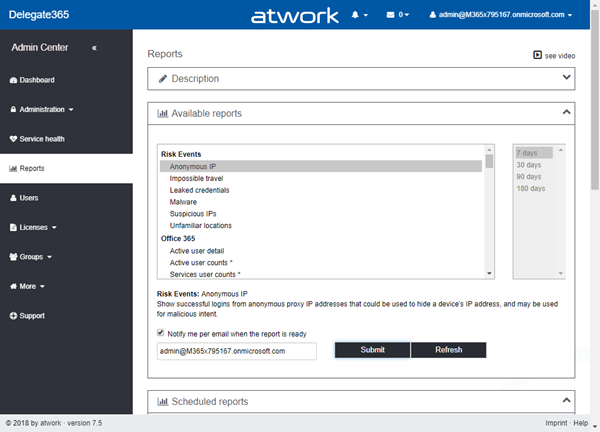 The report categories are Risk Events, Office 365, Microsoft Teams, Skype for Business, Yammer, SharePoint, OneDrive, Exchange, and Delegate365. The reports are generated from the Microsoft Office 365 APIs. The Delegate365 reports deliver data as seen in Delegate365. Report #86, the "OneDrive files" report, is located in the Users page if a user is selected, but follows the same principle as all the other reports. When a report is submitted, the job is added to the Scheduled reports section with it’s job number. 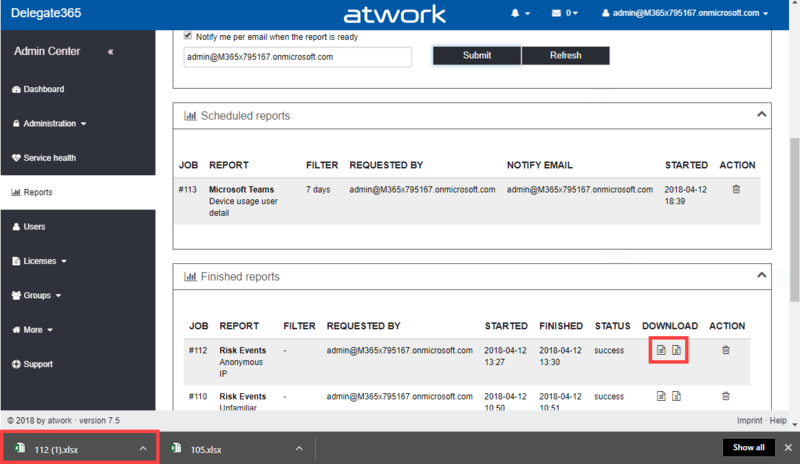 The reporting engine picks that up after a short time, generates the report, and moves the report job to the finished reports sections. See the reports with a short description and a sample output at Delegate365 changelog version 7.4-additional reports with risk events and Microsoft Teams, OneDrive shared with and groups as members. Once a report job is done, it shows up in the finished reports section. If selected, the Admin gets a notification email as well. Each report can be downloaded as CSV or Excel file for further usage as shown here. The downloaded reports can be used in other clients as in Microsoft Excel, Power-BI or other systems. Also, the files can be easily archived in a custom location if needed. All finished reports are stored for 7 days for the user who initiated the report. After that week, all reports are automatically deleted. We hope you and your admin colleagues find a bunch of useful data in the Delegate365 reports in your tenant!